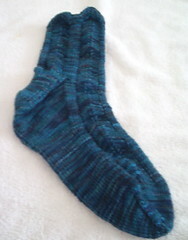 One Broadripple Koigu sock finished for my Sockpal2za pal. The back of my One Skein Wonder - Unfortunately it's a little tight. The back of Rowan Jenny - Knit with Rowan Handknit DK. 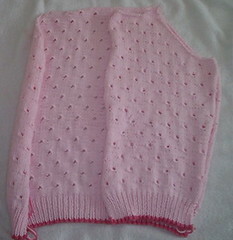 One front of Jenny with the back - I've decided to make a short sleeve cardi. I went to the The Whole Nine Yarns in Woodstock. I got Debbie Bliss Alpaca 2 book and two skeins of Artyarns Supermerino in a pretty light blue color. 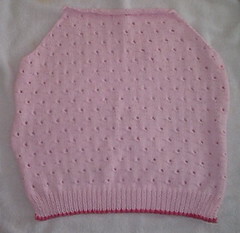 I also started The Hourglass sweater from the Last Minute Knitted Gifts book. I'm using the Purple Cashmerino I bought a while ago. I think I'm going to like it!